Wild parsnip. Like a lonely hitchhiker standing beside the road. Don't pick it up. Foraging for wild parsnips has quite an allure when you think about it – if you like parsnips. I do, actually. Although this plant is edible, I think I’ll stick to ones I grow myself, or buy from farmers markets or grocery stores. 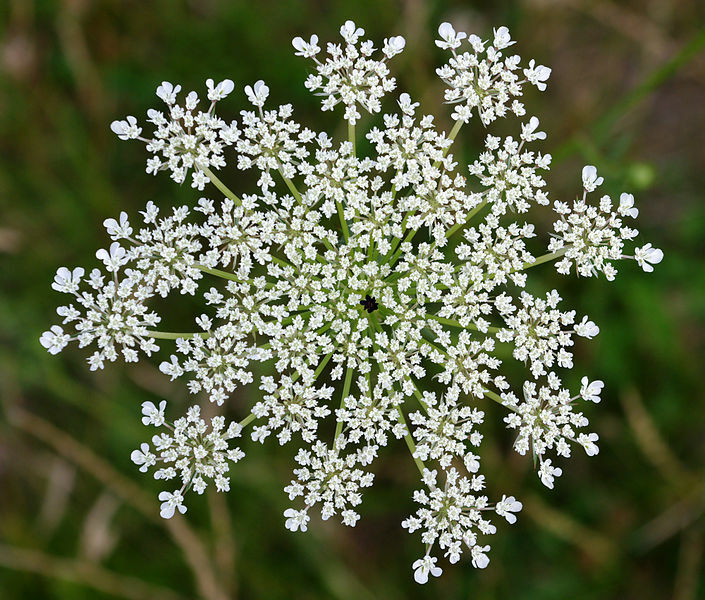 This is Queen Anne's Lace. Pastinaca sativa – the European wild parsnip – is an invasive plant native to Europe and Asia. It was most likely brought with settlers and planted in gardens as a vegetable. It has now escaped and is considered a problem plant. 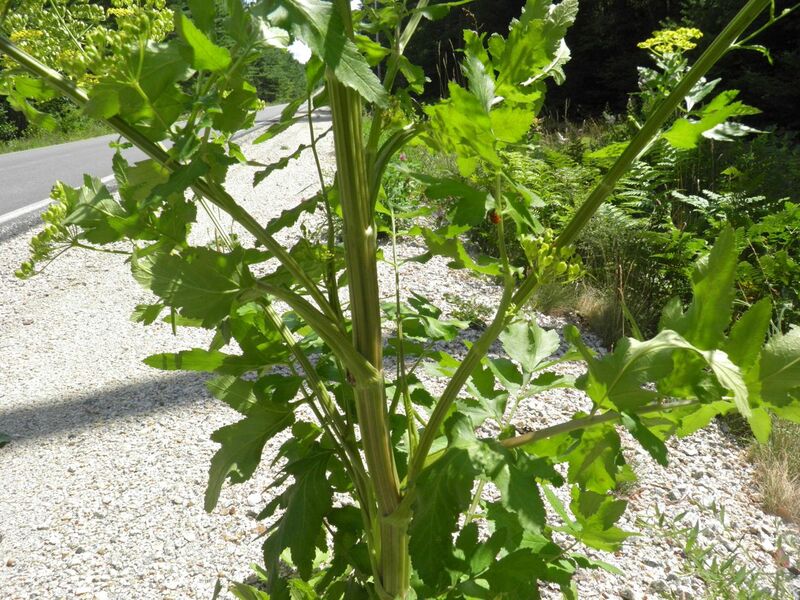 The wild parsnip has two problems associated with it. First, it's invasive, although I haven't seen much evidence of that on the South Shore of Nova Scotia. It’s from its other property: photo-dermatitis caused by the chemical furanocoumarin. I didn’t know what this plant was and after I spotted it I had to come home and do some investigation. It kind of reminded me of Queen Anne’s Lace (wild carrot) with a touch of poison hemlock about it. Lovely, eh? 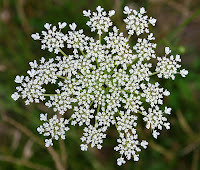 Queen Anne’s lace is edible; poison hemlock is a very nasty customer. 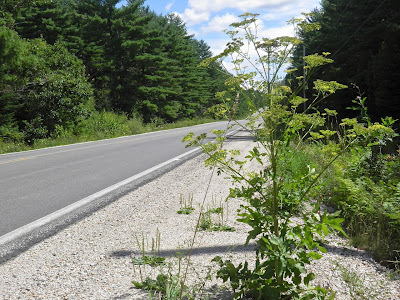 This plant was solitary, standing on the shoulder of the road all alone. I didn’t see another one anywhere around. So not so invasive where I found this one...yet. were several ladybugs on the plant. Photo-dermatitis is an unpleasant, abnormal reaction of the skin to sunlight, to be precise UV light. The sap from the wild parsnip can/will react with your skin and cause rashes, blisters and burns after you come in contact with it. In this way it’s similar to wild hogweed, poison ivy and poison oak. All cause dermatitis reactions. So add this plant to your “touch me not” list. Furanocoumarin is not contained in the root, but is in everything above soil level. So if you want to go a-foraging for roots, wear lots of protective clothing. I think I’ll err on the side of caution and leave it in the ground. There’s a few distinctions you can easily observe between this and Queen Anne’s Lace, in particular. Queen Anne’s Lace grows on spindly stalks with a single, white umbrel on top (that’s fancy-talk for a flat bunch of flowers all together). Wild parsnip is far more robust, multi-branching and yellow flowered. Wild parsnip can grow as tall as 4+ feet; Queen Anne is usually about 2-3 feet maximum. Queen Anne leaves are more feathery like dill, whereas wild parsnip are substantial and look like celery leaves (sort of). They’re easy to tell apart. 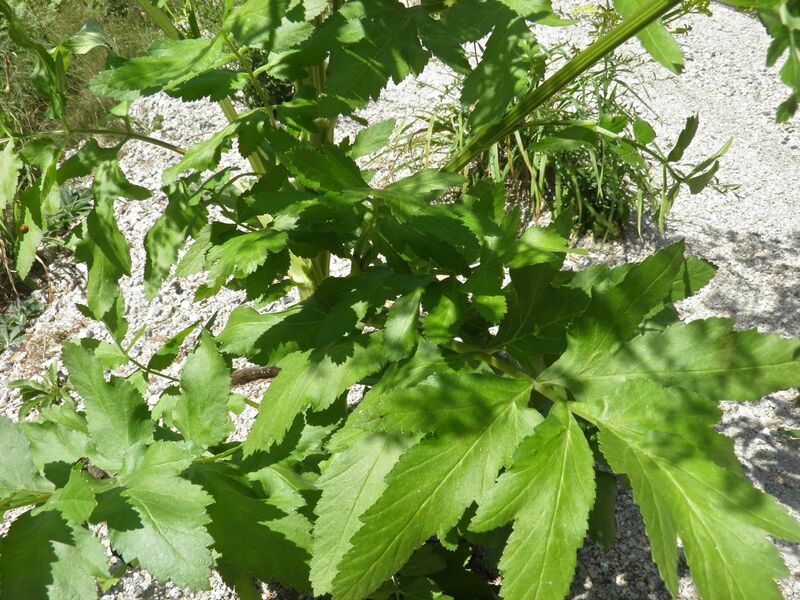 Apparently wild parsnip is now growing in all Canadian provinces, save Nunavut. It is also throughout the USA. This stalk looks nothing at all like Queen Anne's Lace. Getting back to looking but not seeing, on a trip to Halifax the other day I had occasion to be walking behind the Canadian Tire on Quinpool through to Windsor Street. Right along a paved pathway there were at least five or six of them. Obviously they’re everywhere – country or city. 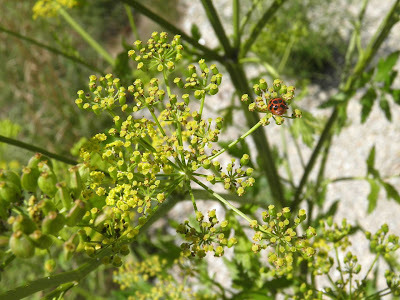 Wild parsnip is certainly pretty enough to be of interest to children as well as adults. So be on your guard.